We have been hearing a wide range of stories about people charging batteries with Quantum-Touch. 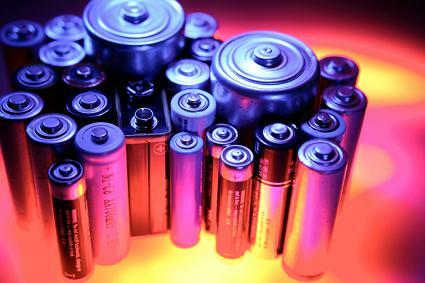 People have been recharging dead batteries from cars, cell phones, cameras, and other devices. Stories like this have certainly attracted our attention. Perhaps this is truly a new ability that we did not previously know about. Perhaps the life-force energy is allowing the chemicals in the various kinds of batteries to interact more efficiently. Perhaps our unlimited spiritual nature will express itself in more and more ways which remind us that we dont know our limits. We don't know our limits! What fun is that? I had a wonderful experience with QT again this past Tuesday. I spent approx. 1 hour working on a woman in a wheelchair who had a stroke and has many other physical difficulties. After the QT session, I was asked to look at her stereo system which was inoperable. I am very technically experienced with all types of technological equipment from the many years I worked in Information Technology for a large corporation. I used ONE hand to turn the system off... it appeared to be in the On Position due to lights being on. I press some buttons for the CD player, off and on several times...nothing happened. I placed TWO hands on the unit and it became operational almost immediately. I then checked the back of the unit to make sure the connections were not loose. Everything was fine. Two days later at church, I was setting up the audio system for a class. I turned on the unit; turned my back to test the microphone; had a thought of inserting a CD and the CD drawer opened all by itself. I thanked it and continued with my work. Since I use QT so very, very often, I feel that the energy is always there, ready to be used and I do use it, in many ways. I have a elder friend who is a Native American Chief. He must have a gazillion cameras in his closet all with dead batteries. He used to just chuckle when I said I could charge them. One day I said, come on Chief, let me show you. He got the deadest of the dead batteries and I ran energy on it for about 15 min. He plugged it back into the camera and his eyes lit up LOL. He said there was about a 45 min charge on it. Of course now I rib him about it whenever I get the chance. To me this is just proof how much we have to learn about ourselves as human beings and just what amazing things were capable of. I have a Logitech cordless mouse and keyboard. Both take AA batteries. My computer is on constantly so both mouse and keyboard get quite a daily workout. The day after I heard about the QT battery charging successes, mouse batteries are critical flashed on my screen. I didnt want to get up and go into the other room to find new batteries and I was right in the middle of something so I stopped, cupped my hands over the mouse and ran energy for about a minute. I didnt take them out of the mouse. The mouse kept on working but the computer icon saying my mouse was critical didnt go away. I did this once a day for about a WEEK, then my keyboard critical icon popped up. I thought it was a glitch and that it was the mouse critical icon again. At that point, I took the batteries out of the mouse, charged each battery individually for about 2 minutes and put them back in my mouse. Viola! One of the two warning icons was gone. A day later, I realized that the second icon was actually for my keyboard and not the mouse! DUH! So I took those two batteries out, charged each for about two minutes each and reinstalled them. Now the Logitech pop-up says mouse batteries good, keyboard batteries good and both warning icons are gone. WOW! I love the confirmation message. I cant wait to see how long they last! Just a quick note to tell you a story of a skeptic; I read your last newsletter and there was a story about someone running energy into a battery to get it to work again. I have an interest in energy healing but I found this one hard to accept so, I tried it my self on a flashlight battery that was not working. I ran energy in to it for a few minutes and was totally shocked when I put the battery in and the light came on for a short time. To convince myself that this really happened I tried this two more different times and it has worked. This has made me get more serious about my interest in energy healing. The concept of charging batteries and machines is not new to me. I've had luck with different types of batteries, electrical appliances and even motorcycles! However, a while ago, I surprised myself after charging a car battery. My van isn't exactly in top shape, but it runs very well for me. I purchased it a couple of years ago with high mileage and have had repairs done here and there since then, but its battery has never been a problem until a few month ago. One morning, when I realized that I couldn't start it up, instead of going to find a neighbor to jump start it (I was expecting so I didn't want the extra walk), I decided to run energy instead. I didn't even get out of the car. I just sat in the drivers seat and imagined that my hands were cupping the vans battery. I wasnt even sure what it looked like or where under the hood it was located, but I imagined that it was in my hands and/or that my hands were on it. As soon as I closed my eyes, I saw the color red, so I ran that color along with running energy. (It felt like a supercharging energy.) Maybe less than 5 minutes later, the car started with a fresh sound. I kept on charging the battery every morning when I started the van over the next 2-3 weeks. Eventually, I could tell that the battery had completely died, but I kept running energy on it anyway. At a certain point I had to charge it every time I turned off the ignition. When I got tired of that, I finally took my car to a garage to have the battery replaced. I'd tried this before and been unsuccessful, but my cables were in the other car, and there weren't that many cars in the lot, so I figured I'd give it a try before looking for a Good Samaritan. So, calling in my unseen help, and stating the intention to charge the battery, I put my hands flat on either side of the plastic top of the battery (not touching the leads), and started sweeping and breathing, running the energy (just basic QT). Knowing how to do QT sure comes in handy! After reading about people at the QT Conference recharging dead batteries, I had the chance to try it myself. A group and I went to a cottage that had not been used since last fall and their clock battery was dead. I pulled out the Double A battery and held the positive against my right hand and the negative against my left hand and then ran energy for 15 minutes. When we left a few days later, the clock was still working! My friends are more interested in Quantum-Touch now. Recently we found an old flashlight that had accidentally been left "on" for the past year in our garage. The flashlight batteries were dead. We turned off the flashlight, created a positive affirmation, focused our attention and intention on the project at hand, brought up the chi, created an energy ball and then continued to run energy on the flashlight batteries for a total of 10 minutes. We turned the flashlight back on and the flashlight roared strong back into life and light. Cool! Another great day with the practical uses of Quantum-Touch! I had success with charging batteries for my dads digital camera this weekend. Before I attempted it I made sure that he and I both knew that the batteries were truly dead. I then ran energy into the batteries for about five minutes. Voila! The camera turned on and I was able to take pictures. How cool! Say What? Hearing Aid batteries recharged! My partner and I were on holidays when my camera went dead. So I just cupped it in my hands and ran energy on it for about 3 minutes. My partner looked on with a sceptical smile, and Voila! It worked! He was amazed, and so was I! For the rest of our month-long holiday, I never put new batteries in the camera. I would just run energy on it whenever it needed recharging. I love my favorite ˜party trick. When at someones home or event and asked ˜what do you do for a living, I explain my job and the QT modality. Most often I get a look of confusion or the simple reply of, ˜Oh, uh-huh. Then, I ask them if they have a ˜dead battery lying around. After testing it to ensure it no longer works, I put it in my hands for about two minutes and then ask them to try it out. It almost always works and even my hairdresser recently shared with me that she was able to charge batteries too! Since it is their battery and you had them test it to ensure it was previously ˜dead, it is pretty hard to dispute that energy exists and the effect it has! Not everyone comes running to buy the book or take a workshop after my ˜party trick demonstration, but I strongly feel that everyones path will eventually cross with QT. So until then, I just keep doing what I love and enjoying the unlimited benefits that are available to all of us through QT.